In the final weeks The True Story of Maddie Bright was mine—what I mean is, the typeset pages were on my kitchen table for the last read before printing—I decided to restructure the beginning chapters. I came up with a formula to alternate timelines. Why hadn’t I thought of this before? I wondered. I contacted the book’s production editor. Within two minutes, I had an email from my publisher—then in London, as I recall—to say the novel was perfect. It was not time to restructure. It was time to press print. You might think that for no other reason than expediency or cost-savings, you were denied some excellent changes in the final novel you read. Hah! Many writers hate editing but I love it. To me, it’s the way to inveigle others in what I’m doing and spend hours on the telephone talking about myself. My goal is to make my colleagues think as much as I do about my characters and story so we can worry together until we’ve got everything exactly as it should be. The longer it goes on, the happier I am. I believe there is a right answer, and our job is to keep changing the novel until we find it. As you can imagine, I’m a dream to work with, if anyone is looking for a writer, for instance. And I’m pretty available, as it happens. My publisher is Annette Barlow from Allen and Unwin, and Annette is not a quick reader of manuscripts, but I am not a quick writer of them so we are a good if ent-like team; we do not move hastily when it comes to our novels, although we are both quite good at our jobs. Annette and I are MAKING NOVELS GREAT AGAIN. Very slowly. With The True Story of Maddie Bright, which was called something else then (Stories We Tell Ourselves?) I arrived at a reasonable draft which I sent to Annette a year and a half ago. In the normal course of events, I would have done another two or three rewrites to get the settings beautiful and the frocks right but I wanted Annette to look at what I’d done because the premise of The True Story of Maddie Bright is so preposterous I worried it wouldn’t work at all. There are three different timelines and settings (1920 various Australia, 1981 Brisbane and 1997 London) plus extracts from not one but two novels by the reclusive writer M. A. Bright (1917 France, 1921 London), a central character (Maddie Bright) who’s a difficult old lady now, a girl back in 1920 when Edward, the prince who later abdicated, toured Australia; he was young, handsome at that time, a bit less so later in life, and there’s also Diana, yes, the Princess of Wales, and in 1997 a journalist (Victoria Byrd) about to marry a Hollywood film star. Simple! Annette’s job here is a really difficult one even with a straightforward thing, which is not what is in front of her. She must glean the novel’s best self—whatever she says should make Maddie Bright’s true story truer. At the risk of mixing several metaphors, I already knew I was running towards a cliff with this novel and I was prepared to jump. But Annette’s job is harder than jumping because she must build the bridge (yes, she’s Gandalf facing the Balrog of Morgoth and I guess that makes me Frodo, which I rather like) so that we don’t fall off and hit the rocks below and die, like Gandalf does. 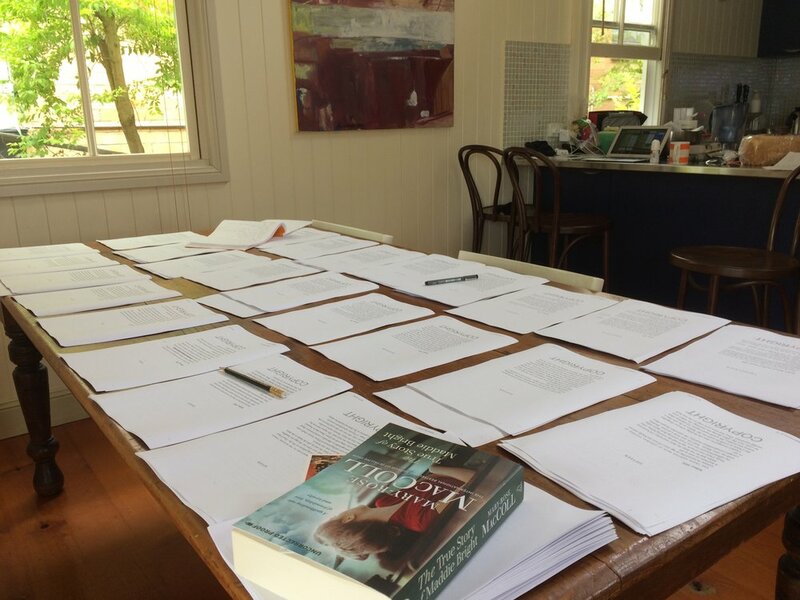 As a publisher, Annette does this in a million ways but the first way is through editing. Luckily, she is already a white wizard so she doesn’t need to be killed by the Balrog. Annette did what’s called the ‘structural’ edit on the novel. ‘There is a letter,’ her structural editor’s report said. ‘Let’s think about that letter.’ This doesn’t seem enormous but it is because it was exactly the right thing to say, the thing that would make Maddie Bright’s story truer. There is a letter in the novel, from Helen Burns who was the prince’s press secretary back in 1920. Now it’s 1981 and the letter has come through the mail and it might change Maddie’s true story. The key relationships in The True Story of Maddie Bright are those between Maddie and Helen, who become friends, and between Helen and Rupert Waters, the prince’s assistant private secretary and friend. If more was made of the letter, these relationships—which I had flinched from in my drafting because they were yet not clear to me—would be stronger. Annette said other things too but the letter was masterful because it was a small thing that meant something big. The letter, Annette maintained, could turn my leap off the cliff into a walk at Rivendell. She didn’t actually say that, not in those words. She would never be that terrible. I immediately agreed wholeheartedly with Annette and set about a rewrite of the novel. That is a joke. That is never what I do. First, I resist. I resist mightily. I tell Annette she is just wrong. The letter is nothing but a plot device. Yes, she says, and novels have plots. Hmph, I say, affecting my best literary demeanour. I am an expert at jumping off cliffs while shooting myself in both feet. What would Annette know? Eventually, I settle down and do some thinking and roll up my sleeves. I work and rework (and rework) the whole thing until I have rendered adequately the relationship Annette is trying to bring forward by asking us to think on the letter—that between Helen and Rupert Waters, the prince’s assistant private secretary. I do other things Annette has suggested, plus many of my own, and the novel starts to look like it might work quite well as a novel. Annette was right. Again. Next is copyediting which sometimes drifts into a mini-structural edit with me because I totally rework everything so much in each draft. I don’t know if other writers do this. I don’t have another way of working and I have written separately on my writing process which I will post as soon as I figure out what it is. My copyeditor was Ali Lavau who has worked on the last three books. She is very thorough. I just wish she wasn’t always so jolly correct as it would be nice for me to caw occasionally. I never get to caw. After the copyedit (you can see how much work goes into the novel you read and then wrap your fish and chips in, and how little the writer has to do with it) comes the proofreader whose job is supposed to be checking for literals, errors introduced when we’ve edited or errors that have been there the whole time that the rest of us have missed. But of course, in my novels there is new material in the proofreading stage because I rewrite so much, so the proofreader has a bigger job. In the case of The True Story of Maddie Bright, Aziza Kuypers actually found a gap in the middle of the bridge we’d built. She helped me see I needed just a little more scaffolding to cross the gap I’d made. It mattered; it mattered a great deal as a journalist noticed it in a proof copy and I could say, hand on heart, I’d fixed it. Of course, I didn’t mention Aziza’s name; it was all me! Over the top of this entire process is Christa Munns, the production editor who tells everyone what to do and when to do it. This is well and truly a full-time occupation, but Christa does much more, and also works on other books, always a surprise to me as she never blanches in the face of more work—and she gets plenty of that from me, pages and pages of changes and new writing she must carefully check and have a view about. Christa read the first draft of The True Story of Maddie Bright, and she took the final pages home over that second Christmas, the one where I decided to restructure the beginning, to read and check we were on track, with further teeny but important suggestions, one that saved us altogether. And then she was ready to press print. In relation to my suggestion that I restructure the beginning of the novel, Christa passed it to Annette who told me it was time to stop. And it was. She was right. She always is. The novel was done, is done, and now, it’s time to move on to the next one which, I’m sad to say, (although everyone at A&U will be glad to know) is a long, long way from editing as yet.